Is there an area in your life that you want to change, but you don’t know how? Is there a behavior that you’ve tried to stop, but you just can’t seem to do it? Is there a negative thought pattern that you have attempted to move on from, but nothing you try ever works? Is there a relationship that you want to repair, but despite all your best intentions, nothing seems to make things better? In other words, do you want to change, but feel stuck? Tim Lane takes you on a nine step journey towards lasting change. This practical and biblical guidance recognises that the path to lasting change can only be found by growing in grace as we look to Christ and are empowered by the Holy Spirit. So these steps are much more than self-help strategies: they are truths that are rooted in Scripture. Whatever your struggle, this warm and encouraging book will empower you to break free from unwanted habits and behaviors that don’t seem to go away. Use this book on your own, with a friend, or in a one-to-one mentoring relationship. Each step ends with a "work it through" exercise to really help you put what you're reading into practice, so that you can make a change in your life that lasts. Whatever your struggle, this warm and encouraging book will help you to get unstuck as you look to Christ in the day-to-day pressures of life. One of the most encouraging promises of the gospel of Jesus Christ is the promise of fresh starts and new beginnings. 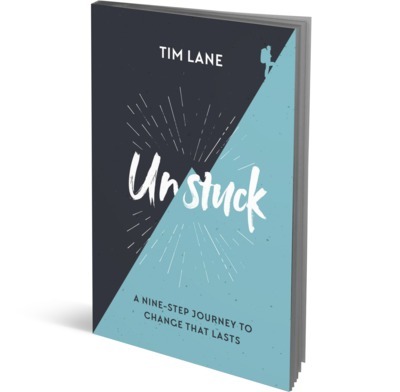 In this very helpful and practical book, Tim Lane not only helps you to understand that promise but shows you, step by step, how to experience that change in your own life and relationships. I can’t imagine who wouldn’t be helped by this book! What do you do when there is a particular sin you just can’t seem to shake from your life? Tim Lane encourages us to work on ourselves, but always in the grounded assurance of God’s character. In the gospel, we are united to the One who is loving enough to save us and powerful enough to transform us. Whether your problem is anger, lust, greed or gossip, is the book to help you believe once more that change is possible.